The last few months have seen a flurry of activity at Isle of Olive. 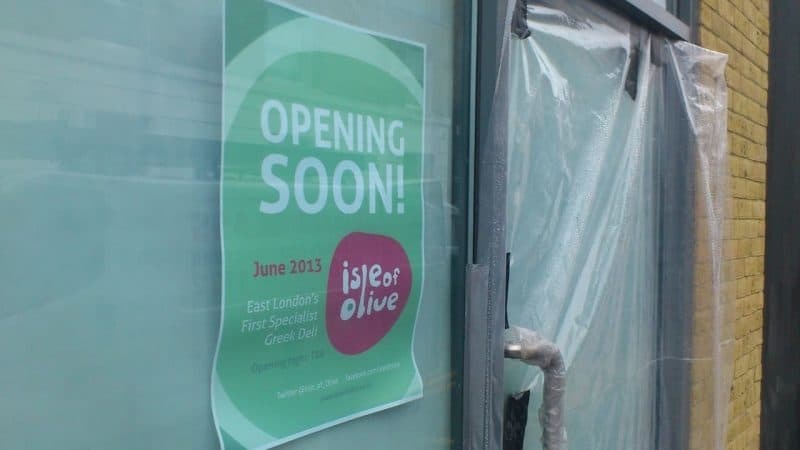 We have been working really hard behind the scenes trying to find the best way to take our business to the next level and today we are proud to announce that the Isle of Olive shop will be opening really soon in London. The shop will be located on Ada Street E8, just a stone’s throw away from Broadway Market, one of East London’s most popular destinations, made famous for its fabulous Saturday market. This is an area, where we have been living in for a good ten years now and we have watched it change and evolve, so it gives us great pleasure to now be part of this change and be able to offer something back to this vibrant and colourful community. The Isle of Olive shop will allow us to much better serve our mission, which is to introduce and represent in the best way we can the amazing range of natural products that are currently produced in Greece. It will enable us to expand on the variety of our core products, which consists of olives, olive oil, herbs and honey as well as to add many new ones, like greek pulses, pasta, nuts, tapenades and by popular demand… some Greek cheeses! It will offer a relaxed environment (away from the cold and the rain of the markets), where one will be able to learn about as well as sample some of our products on the spot since we will have on offer a great range of herbal teas, Greek coffee, tasty Greek pies, yogurt with honey and many other delicacies. A lot of work has already been done, but a lot still remains. So wish us luck and stay tuned! Our opening will take place in June and we will be happy to see many of you in our shop and take you on a trip of Greek delights!